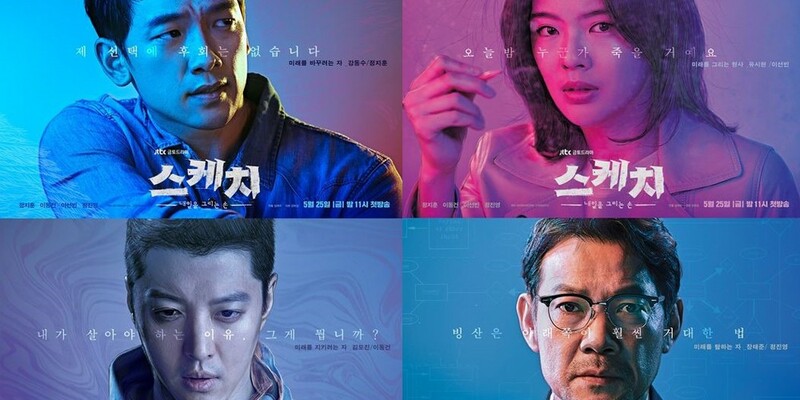 JTBC's new Fri-Sat drama 'Sketch' revealed a set of intense individual character posters of their lead cast - Rain, Lee Dong Gun, Lee Sun Bin, and Jung Jin Young. 'Sketch' is a crime/action drama about an ace detective who loses his lover. Over the course of 72 hours, he partners up with a female detective with the ability to sketch the future by hand on paper, in order to solve the crime involving his lover. Rain is in the role of the main detective Kang Dong Soo, who witnesses the death of his fiancee. Opposite him is Lee Dong Gun, a top class soldier named Kim Do Jin also with a life goal to get revenge on the killer of his wife. Lee Sun Bin is the female detective with the unique ability to sketch the future, Yoo Si Hyun. Finally, Jung Jin Young is a mystery figure who seeks the future, Jang Tae Joon. You can begin the mystery on JTBC's 'Sketch' beginning May 25 at 11 PM KST.